I was invited to the ballet tonight with Rosie's family. I'm always excited when I get to go along. 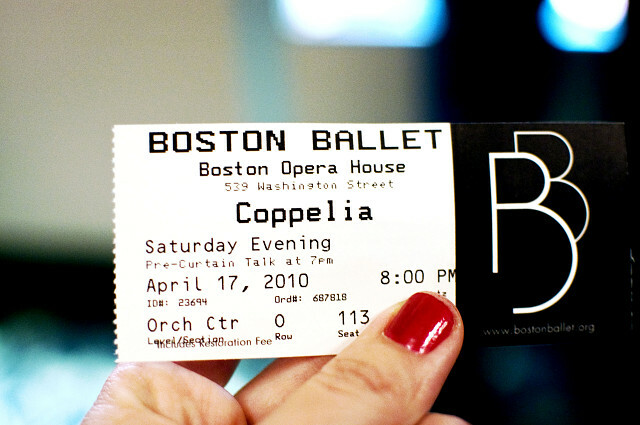 The Opera House is beautiful and the Boston Ballet puts on great shows. Tonight's show was especially good, in my opinion. It's a comedic ballet which is good for kids (there were a lot in the audience) and is just as entertaining for adults. The dancing and costumes were beautiful. All in all it was a nice Saturday night. The only bad thing was my extreme tiredness. I think I'm still worn out from a stressful week at work. I'm used to getting told I look tired (I've inherited my Mom's raccoon eyes), but it seems tonight I looked more tired than usual. I guess that means I should stop goofing around online and get some sleep!